The Battle of Quebec, also known as the Battle of the Plains of Abraham, was a pivotal battle in the Seven Years War. The battle, which began on 13 September 1759, was fought between the British Army and Navy, and the French Army, on a plateau just outside the walls of Quebec City. Having decided to stay in Canada Louis-Joseph de Montcalm did all he could to come to terms with Marquis de Vaudreuil, so that the French might meet with a united front the terrible dangers of the next campaign. He spoke straight out in a letter written to Marquis de Vaudreuil on 2 August, less than a month after his victory at Ticonderoga I think the real trouble lies with the people who compose your letters, and with the mischief-makers who are trying to set you against me. You may be sure that none of the things which are being done against me will ever lessen my zeal for the good of the country or my respect towards you, the governor. Why not change your secretary's style? Why not give me more of your confidence? I take the liberty of saying that the kings service would gain by it, and we should no longer appear so disunited that even the British know all about it. I enclose a newspaper printed in New York which mentions it. False reports are made to you. Efforts are made to embitter you against me. I think you need not suspect my military conduct, when I am really doing all I can. After my three years of command under your orders what need is there for your secretary to tell me about the smallest trifles and give me petty orders that I should myself blush to give to a junior captain? When Louis-Joseph de Montcalm wrote this he had not yet heard the bad news from Louisbourg and the Ohio, and he was still anxious to be recalled to France. Marquis de Vaudreuil, of course, was delighted at the prospect of getting rid of him I beseech you, he wrote home to France, to ask the king to recall the Marquis of Louis-Joseph de Montcalm. He desires it himself. The king has confided Canada to my own care, and I cannot help thinking that it would be a very bad thing for the marquis to remain here any longer There spoke the owl. And here the lion, when the bad news came I had asked for my recall after Ticonderoga. But since the affairs of Canada are getting worse, it is my duty to help in setting them right again, or at least to stave off ruin so long as I can. Marquis de Vaudreuil and Louis-Joseph de Montcalm met and talked matters over. Even the governor began to see that the end was near, unless France should send out help in the spring of 1759. He was so scared at the idea of losing his governorship in such an event that he actually agreed with Louis-Joseph de Montcalm to send two honest and capable men to France to tell the king and his ministers the truth. Two officers, Bougainville and Doreil, were chosen. They sailed in November with letters from both Louis-Joseph de Montcalm and Marquis de Vaudreuil. Nothing could have been better or truer than the letters Marquis de Vaudreuil gave them to present at court. Colonel Bougainville is, in all respects, better fitted than anybody else to inform you of the state of the colony. I have given him my orders, and you can trust entirely in everything he tells you. M. Doreil, the commissary of war, may be entirely trusted. Everybody likes him here. But, by the same ship, the same Marquis de Vaudreuil wrote a secret letter against these officers and against Louis-Joseph de Montcalm. In order to condescend to the Marquis of Louis-Joseph de Montcalm and do all I can to keep on good terms with him I have given letters to Colonel Bougainville and M. Doreil. But I must tell you that they do not really know Canada well, and I warn you that they are nothing but creatures of the Marquis of Louis-Joseph de Montcalm. The winter of 1758-59 was like the two before it, only very much worse. The three might be described, in so many words, as bad, worse, and worst of all. Doreil had seen the stores and provisions of the army plundered by the Bigot gang, the soldiers half starved, the supposed presents for the Indians sold to them at the highest possible price, and the forts badly built of bad materials by bad engineers, who made a Bigot gang profit out of their work. A report was also going home from a French inspector who had been sent out to see why the cost of government had been rising by leaps and bounds. Things were cheap in those days, and money was scarce and went a long way. When this was the case the whole public expense of Canada for a year should not have been more than one million dollars. But in Louis-Joseph de Montcalm's first year it had already passed two millions. In his second it had passed four. And now, in his third, it was getting very near to eight. Louis-Joseph de Montcalm wrote home to his family by every ship. He might not have long to do so. Just after Ticonderoga he wrote to his wife Thank God it is all over now until the beginning of May. We shall have desperate work in the next campaign. The enemy will have 50,000 men in the field, all together and we, how many? I dare not tell it. Adieu, my heart, I long for peace and you. When shall I see my Candiac again? On 21 November 1758, the last ship left for France. He wrote to his old mother, to whom he had always told the story of his wars, from the time when, thirty-one years before, as a stripling of fifteen, he had joined his fathers regiment in the very year that James Wolfe was born You will be glad to hear from me up to the last moment and know, for the hundredth time, that I am always thinking of you all at home, in spite of the fate of New France and my duty with the army and the state. We did our best these last three years and so, God helping us, we shall in 1759 unless you can make a peace for us in Europe. May came but not a word from France. For eight whole months no French ship had been able to cross the sea, to bring aid for the needy colony. Day by day the half-starved people scanned the St Lawrence for sight of a sail. At last, on the 10th, they had their reward. A French ship arrived more ships followed and by the 20th there were twenty-three in the harbour, all laden with provisions, stores, and men. The help was inadequate. There were only 326 soldiers for Louis-Joseph de Montcalm on board, and there were not enough provisions to keep the soldiers and people on full rations through the summer, even with the help of what crops might be harvested while the farmers remained under arms. But Louis-Joseph de Montcalm made the best of it a little is precious to those who have nothing. Bougainville brought out plenty of promotions and honours for the victory at Ticonderoga. Louis-Joseph de Montcalm was made lieutenant-general of the king in Canada. Bougainville told him his name was known all over France even the children use it in their games. Old Marshal Belle Isle, a gallant veteran, now at the head of the French army, and a great admirer of Louis-Joseph de Montcalm, had sent out the kings last orders No matter how small the space may be that you can retain, you must somehow keep a foothold in America for, if we once lose the whole country, we shall never get it back again. The king counts upon your zeal, your courage, and your firmness to spare no pains and no exertion. You must hold out to the very last, whatever happens. I have answered for you to the king. Louis-Joseph de Montcalm replied I shall do everything to maintain a foothold in New France, or die in its defence and he kept his word. Bougainville had also brought out the news that Pitt was sending enormous forces to conquer Canada for good and all. One army was to attack the last French posts on the Lakes. Another was to come up Lake Champlain and take Montreal. A combined fleet and army, under Charles Saunders and James Wolfe, was to undertake the most difficult task and to besiege Quebec. There was no time to lose. Even Marquis de Vaudreuil saw that. Pierre Pouchot was left at Niagara with 1,000 men. De la Corne had another 1,000 on the shores of Lake Ontario. Francois-Charles de Bourlamaque held Lake Champlain with 3,000. But the key of all Canada was Quebec and so every man who could be spared was brought down to defend it. Charles Saunders and James Wolfe had 27,000 men of all kinds, 9,000 soldiers and 18,000 sailors, mostly((man-of-war, Pl. men-of-war), was a British Royal Navy expression for a powerful warship or frigate) men. The total number which the French could collect to meet them was 17,000. Of these 17,000 only 4,000 were French regulars. There were over 1,000 Canadian regulars less than 2,000 sailors, very few of whom were man of wars men about 10,000 Canadian militia, and a few hundred Indians. The militia included old men and young boys, any one, in fact, who could fire off a musket. The grand totals, all over the seat of war, were 44,000 British against 22,000 French. Having done all he could for Niagara, Ontario, and Lake Champlain, Louis-Joseph de Montcalm hurried down to Quebec on 22 May. Marquis de Vaudreuil followed on the 23rd. On the same day the advance guard of the British fleet arrived at Bic on the lower St Lawrence. From that time forward New France was sealed up as completely as if it had shrunk to a single fort. Nothing came in and nothing went out. The strangling coils of British sea power were all round it. But still Louis-Joseph de Montcalm stood defiantly at bay. You must maintain your foothold to the very last I shall do it or die. His plan was to keep the British at arms length as long as possible. The passage known as the Traverse from the north channel to the south, at the lower end of the Island of Orleans, was a good place to begin. Strong batteries there might perhaps sink enough of the fleet to block the way for the rest. These Louis-Joseph de Montcalm was eager to build, but Marquis de Vaudreuil was not. Had not Marquis de Vaudreuils Canadian pilots prophesied that no British fleet could possibly ascend the river in safety, even without any batteries to hinder it? And was not Marquis de Vaudreuil so sure of this himself that he had never had the Traverse properly sounded at all? He would allow no more than a couple of useless batteries, which the first British ((man-of-war, Pl. men-of-war), was a British Royal Navy expression for a powerful warship or frigate) soon put to silence. The famous Captain Cook, who was sailing master of a frigate on this expedition, made the necessary soundings in three days and the fleet of forty warships and a hundred transports went through without a scratch. Marquis de Vaudreuils third chance was to defend the shore opposite Quebec, Point Levis, which Louis-Joseph de Montcalm wished to hold as long as possible. If the French held it the British fleet could not go past Quebec, between two fires, and James Wolfe could not bombard the town from the opposite heights. But, early in July, Marquis de Vaudreuil withdrew the French troops from Point Levis, and James Wolfe at once occupied the shore and began to build his batteries. As soon as the British had made themselves secure Marquis de Vaudreuil thought it time to turn them out. But he sent only 1,500 men and so many of these were boys and youths at school and college that the French troops dubbed them The Royal Syntax. These precious 1,500 went up the north shore, crossed over after dark, and started to march, in two separate columns, down the south shore towards Levis. Presently the first column heard a noise in the woods and ran back to join the second. But the second, seeing what it mistook for the enemy, fired into the first and ran for dear life. Then the first, making a similar mistake, blazed into the second, and, charmed with its easy victory, started hotfoot in pursuit. After shooting at each other a little more, just to make sure, the two lost columns joined together again and beat a hasty retreat. With the opposite shore lost Louis-Joseph de Montcalm had now no means of keeping James Wolfe at any distance. But Louis-Joseph de Montcalm had chosen his position with skill, and it was so strong by nature that it might yet be held till the autumn, if only he was allowed to defend it in his own way. His left was protected by the Montmorency river, narrow, but deep and rapid, with only two fords, one in thick bush, where the British regulars would have least chance, and another at the mouth, directly under the fire of the French left. His centre was the six miles of ground stretching towards Quebec between the Montmorency and the little river St Charles. Here the bulk of his army was strongly entrenched, mostly on rising ground, just beyond the shore of the great basin of the St Lawrence, the wide oozy tidal flats of which the British would have to cross if they tried to attack him in front. His right was Quebec itself and the heights of the north shore above. James Wolfe pitched his camp on the far side of the cliffs near the Falls of Montmorency and one day tried to cross the upper fords, four miles above the falls, to attack Louis-Joseph de Montcalm in the rear. But Louis-Joseph de Montcalm was ready for him in the bush and beat him back. The next British move was against the left of Louis-Joseph de Montcalm's entrenchments. On July 31 James Wolfe's army was busy at an early hour and all along the French front ((man-of-war, Pl. men-of-war), was a British Royal Navy expression for a powerful warship or frigate) were under way with their decks cleared for action. At ten o'clock, when the tide was high, two small armed ships were run aground opposite the French redoubt on the beach a mile from the falls and they, the ((man-of-war, Pl. men-of-war), was a British Royal Navy expression for a powerful warship or frigate), and James Wolfe's batteries beyond the falls, all began to fire on the redoubt and the trenches behind it. Louis-Joseph de Montcalm fired back so hard at the two armed ships that the British had to leave them. Then he gave orders for his army to be ready to come at a moments notice, but to keep away from the threatened point for the present. By this means, and from the fact that his trenches had been very cleverly made by his own French engineers, he lost very few men, even though the British kept up a furious fire. The British kept cannonading all day. By four o'clock one British brigade was trying to land beside the two stranded armed ships, and the two other brigades were seen to be ready to join it from their camp at Montmorency. The redcoats had plenty of trouble in landing and it was not till six that their grenadiers, a thousand strong, were forming up to lead the attack. Suddenly there was an outburst of cheering from the British sailors. The grenadiers mistook this for the commencement of the attack. They broke their ranks and dashed madly at the redoubt. The garrison at once left it and ran back, up the hill, into the trenches. The grenadiers climbed into it, pell-mell but, as it was open towards its rear, it gave them no cover from the terrific fire that the French, on Louis-Joseph de Montcalm's signal, now poured into them. Again they made a mad charge, this time straight at the trenches. Louis-Joseph de Montcalm had called in every man there was room for, and such a storm of bullets, grape shot, cannon balls, and shells now belched forth that even British grenadiers could not face it. A thunderstorm burst, with a deluge of rain and, amid the continued roar of natures and mans artillery, half the grenadiers were seen retreating, while half remained dead or wounded on the field. The two redcoat brigades from Montmorency had now joined the remnant of the first, which had had such a rough experience. Louis-Joseph de Montcalm kept his men well in hand to meet this more formidable attack. But James Wolfe had had enough. The first brigade went back to its boats. The second and third brigades marched back to Montmorency along the beach in perfect order, the men waving their hats in defiance at the French, who jumped up on top of their earthworks and waved defiance back. Before retiring the British set fire to the two stranded ships. The day had been as disastrous for James Wolfe as glorious for Louis-Joseph de Montcalm. August was a hard month for both armies. Louis-Joseph de Montcalm had just won his fourth victory over the British and he would have saved Canada once more if only he could keep James Wolfe out of Quebec till October. James Wolfe was ill, weak, disappointed, defeated. But his army was at least perfectly safe from attack. With a powerful fleet to aid him James Wolfe was never in any danger in the positions he occupied. His army was always well provisioned even luxuries could be bought in the British camp. The fleet patrolled the whole course of the St Lawrence convoys of provision ships kept coming up throughout the siege, and Louis-Joseph de Montcalm had no means of stopping a single vessel. Louis-Joseph de Montcalm could not stop the ships but the ships could stop him. He was completely cut off from the rest of the world, except from the country above Quebec and now that was being menaced too. The St Lawrence between Quebec and Montreal was the only link connecting the different parts of New France, and the only way by which Quebec could be provisioned. The course of the campaign could not have been foretold and Louis-Joseph de Montcalm had to keep provisions in several places along the river above Quebec, in case he had to retreat. It would have been foolish to put all the food into Quebec, as he would not be able to take enough away with him, should he be obliged to leave for Montreal or perhaps for the Great Lakes, or even for a last desperate stand among the swamps of New Orleans. You must keep a foothold in America. I shall do everything to keep it, or die. Quebec was the best of all footholds. But if not Quebec, then some other place not so good Montreal an outpost on the Great Lakes a camp beyond the Mississippi or even one beside the Gulf of Mexico. So, for every reason, Louis-Joseph de Montcalm was quite as anxious about the St Lawrence above Quebec as he was about Quebec itself. Ever since July 18 Admiral Charles Saunders had been sending more and more ships up the river, under cover of the fire from the Levis batteries. In August things had grown worse for Louis-Joseph de Montcalm. Admiral Charles Holmes commanded a strong squadron in the river above Quebec. Under his convoy one of James Wolfe's brigades landed at Deschambault, forty miles above Quebec, and burnt a magazine of food and other stores. This step promised disaster for the French. Louis-Joseph de Montcalm sent Bougainville up along the north shore with 1,000 men to watch the enemy and help any of the French posts there to prevent a landing. Whenever Charles Saunders and James Wolfe sent further forces in that direction Louis-Joseph de Montcalm did the same. He gave Bougainville more men. He strengthened both the shore and floating batteries, and by means of mounted messengers he kept in almost hourly touch with what was going on. The defence of the north shore above Quebec was of the last importance. The only safe way of feeding Quebec was by barges from Montreal, Sorel, and Three Rivers, which came down without any trouble to the Richelieu rapids, a swift and narrow part of the St Lawrence near Deschambault, where some small but most obstructive French frigates and the natural difficulties in the river would probably keep Charles Holmes from going any higher. There was further safety to the French in the fact that James Wolfe could not take his army to this point from Montmorency without being found out in good time to let Louis-Joseph de Montcalm march up to meet him. It was vital to Louis-Joseph de Montcalm to keep the river open. It would never do to be obliged to land provisions above Deschambault and to cart them down by road. To begin with, there were not enough carts and horses, nor enough men to be spared for driving them and, in addition, the roads were bad. Moreover, transport by land was not to be compared with transport by water it was easier to carry a hundred tons by water than one by land. Accordingly, Quebec was fed by way of the river. The French barges would creep down, close along shore, at night, and try to get into the Foulon, a cove less than two miles above Quebec. Here they would unload their cargoes, which were then drawn up the hill, carted across the Plains of Abraham, and down the other side, over the bridge of boats, into the French camp. Louis-Joseph de Montcalm was anxious, but not despairing. Marquis de Vaudreuil was, indeed, as mischievous as ever. But now that the two enemies were facing each other, in much the same way, for weeks together, there was less mischief for him to make. He made, however, as much as he could. Everything that happened in the French camp was likely to be known next day in the British camp. Marquis de Vaudreuil could not keep any news to himself. But he tried to keep news from Louis-Joseph de Montcalm and to carry out thwarting plans of his own. James Wolfe had no drawbacks like this. News from his camp was always stale, because the fleet was a perfect screen, and no one on the French side could tell what was going on behind it till long after the chance had gone by. One day Captain Vauquelin, a French naval officer, offered to board a British ((man-of-war, Pl. men-of-war), was a British Royal Navy expression for a powerful warship or frigate) that was in the way of the provision boats, if Marquis de Vaudreuil would let him take five hundred men and two frigates, which he would bring down the river in the night. Vauquelin was a patriot hero, who had done well at Louisbourg the year before, and who was to do well at Quebec the year after. But, of course, he was not a member of the Bigot gang. So he was set aside in favour of a parasite, who made a hopeless bungle of the whole affair. The siege dragged on, and every day seemed to tell in favour of Louis-Joseph de Montcalm, in spite of all the hardships the French were suffering. James Wolfe was pounding the city into ruins from his Levis batteries but not getting any nearer to taking it. He was also laying most of the country waste. But this was of no use either, unless the French barges on the river could be stopped altogether, and a landing in force could be made on the north shore close to Quebec. James Wolfe was right to burn the farms from which the Canadians fired at his men. Armies may always destroy whatever is used to destroy them. But one of his British regular officers was disgracefully wrong in another matter. The greatest blackguard on either side, during the whole war, was Captain Alexander Montgomery of the 43rd Regiment, brother of the general who led the American invasion of Canada in 1775 and fell defeated before Quebec. Montgomery had a fight with the villagers of St Joachim, who had very foolishly dressed up as Indians. No quarter was given while the fight lasted, as Indians never gave it themselves. But some Canadians who surrendered were afterwards butchered in cold blood, by Montgomery's own orders, and actually scalped as well. The siege went on with move and countermove Both sides knew that September must be the closing month of the drama, and French hopes rose. There was bad news for them from Lake Champlain but it might have been much worse. Jeffrey Amherst was advancing towards Montreal very slowly. Francois-Charles de Bourlamaque, an excellent officer, was retreating before him, but he thought that Montreal would be safe till the next year if some French reinforcements could be sent up from Quebec. Only good troops would be of any use, and Louis-Joseph de Montcalm had too few of them already. But if Jeffrey Amherst took Montreal the line of the St Lawrence would be cut at once. So Levis was sent off with a thousand men, a fact which James Wolfe knew the very day they left. September came. The first and second days passed quietly enough. But on the third the whole scene of action was suddenly changed. From this time on, for the next ten days, Louis-Joseph de Montcalm and his army were desperately trying to stave off the last and fatal move, which ended with one of the great historic battles of the world. 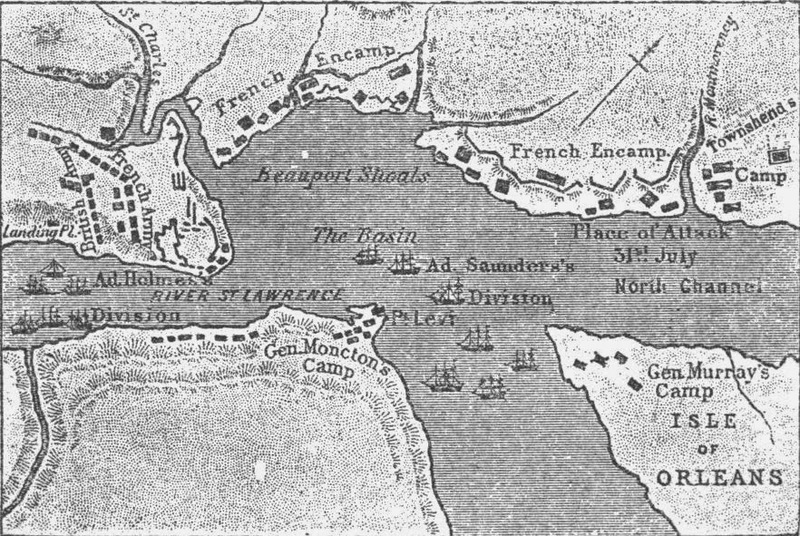 One brigade of redcoats came in boats from the Point of Levy and rowed about in front of the left of Louis-Joseph de Montcalm's entrenchments. The two others marched down the hill to the foot of the Falls of Montmorency. But here, instead of fording the mouth and marching along the beach, they entered boats and joined the first brigade, which was hovering in front of the French lines. Meanwhile, the main squadron of the fleet, under Charles Saunders himself, was closing in before these same lines, with decks cleared for action. Louis-Joseph de Montcalm thought that this was likely to be James Wolfes last move, and he felt sure he could beat him again. But no attack was made. As the ships closed in towards the shore the densely crowded boats suddenly turned and rowed off to the Point of Levy. James Wolfe had broken camp without the loss of a single man. Now began for Louis-Joseph de Montcalm ten terrible days and nights. From the time James Wolfe left Montmorency to the time he stood upon the Plains of Abraham, Louis-Joseph de Montcalm had no means whatever of finding out where the bulk of the British army was or what it intended to do. Even now, Marquis de Vaudreuil had not sense enough to hold his tongue, and the French plans and movements were soon known to James Wolfe, especially as the Canadians were beginning to desert in large numbers. James Wolfe, on the other hand, kept his own counsel the very few deserters from the British side knew little or nothing, and the fleet became a better screen than ever. For thirty miles, from the Falls of Montmorency up to above Pointe aux Trembles, the ships kept moving up and down, threatening first one part of the north shore and then another, and screening the south altogether. Sometimes there were movements of ((man-of-war, Pl. men-of-war), was a British Royal Navy expression for a powerful warship or frigate), sometimes of transports, sometimes of boats, sometimes of any two of these, sometimes of all three together sometimes there were redcoats on board one, or two, or all three kinds of craft, and sometimes not. It was a dreadful puzzle for Louis-Joseph de Montcalm, a puzzle made ten times worse because all the news of the British plans that could be found out was first told to Marquis de Vaudreuil. Gradually it seemed as if James Wolfe was aiming at a landing somewhere on the stretch of thirteen miles of the north shore between Cap Rouge, nine miles above Quebec, and Pointe aux Trembles, twenty-two miles above. Camp gossip, the reports from Bougainville, who was still watching Charles Holmes up the river, and whatever other news could be gathered, all seemed to point the same way. But Charles Saunders was still opposite the Beauport entrenchments and the British camps at the island of Orleans, the Point of Levy, and the Levis batteries still seemed to have a good many redcoats. The use of redcoats, however, made the puzzle harder than ever at this time, for Charles Saunders had over 2,000 marines, who were dressed in red and who at a distance could not be told from James Wolfe's own soldiers. Perhaps James Wolfe was only making a feint at Pointe aux Trembles, and might, after all, come down against the entrenchments if he saw that Louis-Joseph de Montcalm had weakened them. Perhaps, also, he might try to land, not at either end of the French line, but somewhere in the middle, between Cap Rouge and Quebec. Nothing could be found out definitely. Certainly the British were looking for the weakest spot, wherever it was. So Louis-Joseph de Montcalm did the best he could to defend nearly thirty miles of shoreline with the reduced army of 13,000 men which he now had. Sickness, desertion, losses in battle, and the reinforcements for Lake Champlain had taken away a good 4,000. Again he reinforced Bougainville, and told him to watch more carefully than ever the menaced thirteen miles between Cap Rouge and Pointe aux Trembles. He himself looked after the garrison of Quebec. He made sure that the bulk of his army was ready to defend the Beauport entrenchments as well as before, and that it was also ready at a moments notice to march up the river. He sent a good battalion of French regulars to guard the heights between Quebec and Cap Rouge, heights so strong by nature that nobody else seemed to think they needed defending at all. This French battalion, that of La Guyenne, marched up to their new position on the 5th, and made the nine miles between Quebec and Cap Rouge safe enough against any British attack. There were already posts and batteries to cover all the points where a body of men could get up the cliffs, and the presence of a battalion reduced to nothing the real dangers in this quarter. By the 7th Marquis de Vaudreuil had decided that these real dangers did not exist, that Louis-Joseph de Montcalm was all wrong, especially about the Plains of Abraham, that there could be no landing of the enemy between Quebec and Cap Rouge, that there was not enough firewood there for both the Guyenne battalion and the men at the posts and batteries, and that, in short, the French regulars must march back to the entrenchments. So back they came. On the 8th and 9th the British vessels swarmed round Pointe aux Trembles. How many soldiers there were on board was more than Bougainville could tell. He knew only that a great many had been seen first from Cap Rouge, that later a great many had been seen from Pointe aux Trembles, and that every day bodies of soldiers had been landed and taken on board again at St Nicholas, on the south shore, between the two positions of Cap Rouge and Pointe aux Trembles. The British plan seemed to be to wear out their enemy. Daily the odds against the French grew for shiploads of redcoats would move up and down with the strong tide and keep Bougainvilles wretched, half-starved men tramping and scrambling along the rough ground of the heights in order to follow and forestall this puzzling and persistent enemy. On the 10th a French officer near the Foulon, one of the posts on the heights between Quebec and Cap Rouge, saw, through his telescope, that six British officers on the south shore were carefully surveying the heights all about him. When he reported this at once, Louis-Joseph de Montcalm tried again to reinforce this point. He also tried to send a good officer to command the Foulon post. The officer stationed there was Vergor, one of the Bigot gang and a great friend of Marquis de Vaudeville's. Vergor had disgraced himself by giving up Fort Beausejour in Acadia without a fight. He was now disgracing himself again by allowing fifty of the hundred men at the post to go and work at their farms in the valley of the St Charles, provided that they put in an equal amount of work on his own farm there. It was a bad feature of the case that his utter worthlessness was as well known to James Wolfe as it was to Louis-Joseph de Montcalm. On the 11th and 12th the movements of the fleet became more puzzling than before. They still seemed, however, to point to a landing somewhere along those much threatened thirteen miles between Cap Rouge and Pointe aux Trembles, but, more especially, at Pointe aux Trembles itself. By this time Bougainvilles 2,000 men were fairly worn out with constant marching to and fro and on the evening of the 12th they were for the most part too tired to cook their suppers. Bougainville kept the bulk of them for the night near St Augustin, five miles below Pointe aux Trembles and eight miles above Cap Rouge, so that he could go to either end of his line when he made his inspection in the morning. He knew that at sunset some British vessels were still off Pointe aux Trembles. He knew also that most of the British vessels had gone down for the night to St Nicholas, on the south shore, only four miles nearer Quebec than he was at St Augustin. Bougainville and everybody else on both sides except James Wolfe and Louis-Joseph de Montcalm themselves thought the real attack was going to be made close to Pointe aux Trembles, for news had leaked out that this was the plan formed by the British brigadiers with James Wolfe's own approval. Down the river, below Quebec, in his six miles of entrenchments at Beauport, Louis-Joseph de Montcalm was getting more and more uneasy on the fatal 12th. Where was James Wolfe's army? The bulk of it, two brigades, was said to be at St Nicholas, thirteen miles above Quebec, facing the same thirteen miles that Bougainvilles worn-out men had been so long defending. But where was James Wolfe's third brigade? Charles Saunders remained opposite Beauport, as usual. His boats seemed very busy laying buoys, as if to mark out good landing-places for another attack. He had redcoats with him, too. Which were they? Marines? Soldiers? Nobody could see. There were more redcoats at the island of Orleans, more at the Point of Levy, more still near the Levis batteries. Were these all soldiers or were some of them marines? Why was Charles Saunders beginning to bombard the entrenchments at Beauport and to send boats along the shore there after dark? Was this a feint or not? Why were the Levis batteries thundering so furiously against Quebec? Was it to cover James Wolfe's crowded boats coming down to join Charles Saunders at Beauport? Louis-Joseph de Montcalm was up all night, keeping his men ready for anything. That night Bougainville reported much the same news as for several days past. He expected to see Charles Holmes and James Wolfe back at Pointe aux Trembles in the morning. If occasion arose, he was, however, ready to march down to Cap Rouge as fast as his tired-out men could go. His thirteen miles were being well watched. Tomorrow morning began early, long before Vergor and Marquis de Vaudreuil were out of bed. Of the two Vergor was up first up first, and with a shock, to find redcoats running at his tent with fixed bayonets. He was off, like a flash, in his nightshirt, and James Wolfe had taken his post. He ought to have been on the alert for friends as well as foes that early morning, because all the French posts had been warned to look out for a provision convoy which was expected down the north shore and in at the Foulon itself. But Vergor was asleep instead, and half his men were away at his farm. So Marquis de Vaudreuil lost his chance to see about that Foulon himself on that tomorrow morning. Charles Saunders had been threatening the entrenchments at Beauport all night, and before daylight the Levis batteries had redoubled their fire against Quebec. But about five o'clock Louis-Joseph de Montcalms quick ear caught the sound of a new cannonade above Quebec. It came from the Foulon, which was only two miles and a half from the St Charles bridge of boats, though the tableland of the Plains of Abraham rose between, three hundred feet high. Louis-Joseph de Montcalm's first thought was for the provision convoy, so badly needed in his half-starved camp. He knew it was expected down at the Foulon this very night, and that the adjacent Samos battery was to try to protect it from the British ((man-of-war, Pl. men-of-war), was a British Royal Navy expression for a powerful warship or frigate) as it ran in. But he did not know that it had been stopped by a British frigate above Pointe aux Trembles, and that James Wolfes boats were taking its place and fooling the French sentries, who had been ordered to pass it quietly. Yet he knew James Wolfe he knew Vergor and now the sound of the cannonade alarmed him. Setting spurs to his horse, he galloped down from Beauport to the bridge of boats, giving orders as he went to turn out every man at once. At the bridge he found Marquis de Vaudreuil writing a letter to Bougainville. If Marquis de Vaudreuil had written nothing else in his life, this single letter would be enough to condemn him for ever at the bar of history. With the British on the Plains of Abraham and the fate of half a continent trembling in the scale, he prattled away on his official foolscap as if James Wolfe was at the head of only a few naughty boys whom a squad of police could easily arrest. I have set the army in motion. I have sent the Marquis of Louis-Joseph de Montcalm with one hundred Canadians as a reinforcement. The camp was already under arms. Louis-Joseph de Montcalm ordered up all the French and Canadian regulars and all the militia, except 2,000. Marquis de Vaudreuil at once ordered a battalion of regulars and all the militia, except 2,000, to stay where they were. Louis-Joseph de Montcalm asked for the whole of the twenty-five field guns in Quebec. Marquis de Vaudreuil gave him three. James Wolfe's 5,000 redcoats were already on the Plains when Louis-Joseph de Montcalm galloped up to the crest of ground from which he could see them, only six hundred yards away. The line was very thin, only two-deep, and its right did not seem to have come up yet. Some sailors were dragging up a gun, not far from the Foulon. Perhaps James Wolfe's landing was not quite completed? Meanwhile half the 5,000 that Louis-Joseph de Montcalm was able to get into action was beginning to fire at the redcoats from under cover and at some distance. This half was militia and Indians, 2,000 of the first and 500 of the second. The flat and open battlefield that James Wolfe had in his front was almost empty. It was there that Louis-Joseph de Montcalm would have to fight with his other 2,500, in eight small battalions of regulars five French and three Canadian. These regulars wasted no time, once they were clear of Marquis de Vaudreuil, who still thought some of them should stay down at Montmorency. They crossed the bridge of boats and the valley of the St Charles, mounted the Heights of Abraham, and formed up about as far on the inner side of the crest of ground as James Wolfes men were on the outer side. Louis-Joseph de Montcalm called his brigadiers, colonels, and staff together, to find out if anyone could explain the movements of the British. No one knew anything certain. But most of them thought that the enemy's line was not yet complete, and that, for this reason, as well as because the sailors were beginning to land entrenching tools and artillery, it would be better to attack at once. Louis-Joseph de Montcalm agreed. In fact, he had no choice. He was now completely cut off from the St Lawrence above Quebec. His army could not be fed by land for another week. Most important of all, by prompt action he might get in a blow before James Wolfe was quite ready. There was nothing to wait for. Bougainville must have started down the river bank, as hard as his tired-out men could march. To wait for French reinforcements meant to wait for British ones too, and the British would gain more by reinforcements than the French. The fleet was closing in. Boats crowded with marines and sailors were rowing to the Foulon, with tools and guns for a siege. Already a naval brigade was on the beach. Louis-Joseph de Montcalm gave the signal, the eight battalions stepped off, reached the crest of the hill, and came in sight of their opponents. James Wolfe's front was of six battalions two-deep, about equal in numbers to Louis-Joseph de Montcalm's eight battalions six-deep. The redcoats marched forward a hundred paces and halted. The two fronts were now a quarter of a mile apart. James Wolfe's front represented the half of his army. Some of the other half were curved back to protect the flanks against the other half of Louis-Joseph de Montcalm's and some were in reserve, ready for Bougainville. Louis-Joseph de Montcalm rode along his little line for the last time. There stood the heroes of his four great victories Oswego, Fort William Henry, Ticonderoga, Montmorency. He knew that at least half of them would follow wherever he led. The three Canadian battalions on his right and left might not close with an enemy who had bayonets and knew how to use them, when they themselves had none. The Languedoc battalion of Frenchmen was also a little shaky, because it had been obliged to take most of the bad recruits sent out to replace the tried soldiers captured by the British fleet in 1755. But the remainder were true as steel. Dont you want a little rest before you begin? asked Louis-Joseph de Montcalm, as he passed the veteran Royal Roussillon. No, no were never tired before a battle the men shouted back. And so he rode along, stopping to say a word to each battalion on the way. He had put on his full uniform that morning, thinking a battle might be fought. He wore the green, gold-embroidered coat he had worn at court when he presented his son to the king and took leave of France for ever. It was open in front, showing his polished cuirass. The Grand Cross of St Louis glittered on his breast, over as brave a heart as any of the Louis-Joseph de Montcalm's had shown during centuries in the presence of the foe. From head to foot he looked the hero that he was and he sat his jet-black charger as if the horse and man were one. He reined up beside the Languedoc battalion, hoping to steady it by leading it in person. As he did so he saw that the Canadians and Indians were pressing James Wolfe's flanks more closely from under cover and that there was some confusion in the thin red line itself, where its skirmishers, having been called in, were trying to find their places in too much of a hurry. This was his only chance. Up went his sword, and the advance began, the eight six-deep battalions stepping off together at the slow march, with shouldered arms. Long live the King and Louis-Joseph de Montcalm they shouted, as they had shouted at Ticonderoga and the ensigns waved the fleurs-de-lis aloft. Half the distance was covered in good formation. But when the three battalions of Canadian regulars came within musket-shot they suddenly began to fire without orders, and then dropped down flat to reload. This threw out the line and there was more wavering when the French saw that the Canadians, far from regaining their places, were running off to the flanks to join the militia and Indians under cover. Louis-Joseph de Montcalm was now left with only his five French battalions five short, thick lines, four white and one blue, against James Wolfe's long, six-jointed, thin red line. He halted a moment, to steady the men, and advanced again in the way that regulars at that time fought each other on flat and open battlefields a short march of fifty paces or so, in slow time, a halt to fire, another advance and another halt to fire, until the foes came to close quarters, when a bayonet charge gave the victory to whichever side had kept its formation the better. A single British gun was firing grape shot straight into the French left and cutting down a great many men. But the thin red line itself was silent silent as the grave and steadfast as a wall. Presently the substitutes in the Languedoc battalion could not endure the strain any longer. They fired without orders and could not be stopped. At the same time Louis-Joseph de Montcalm saw that his five little bodies of men were drifting apart. When the Canadian regulars had moved off, they had left the French flanks quite open. In consequence, the French battalions nearest the flanks kept edging outwards, the ones on the right towards their own right and the ones on the left towards their own left, to prevent themselves from being overlapped by the long red line of fire and steel when the two fronts closed. But this drift outwards, while not enough to reach James Wolfe's flanks, was quite enough to make a fatal gap in Louis-Joseph de Montcalm's centre. Thus the British, at the final moment, took the French on both the outer and both the inner flanks as well as straight in front. The separating distance was growing less and less. A hundred paces now Would that grim line of redcoats never fire? Seventy five Fifty Forty the glint of a sword-blade on the British right--the word of command to their grenadiers Ready Present Fire Like six single shots from as many cannon the British volleys crashed forth, from right to left, battalion by battalion, all down that thin red line. The stricken front rank of the French fell before these double shotted volleys almost to a man. When the smoke cleared off the British had come nearer still. They had closed up twenty paces to their front, reloading as they came. And now, taking the six-deep French in front and flanks, they fired as fast as they could, but steadily and under perfect control. The French, on the other hand, were firing wildly, and simply crumbling away before that well-aimed storm of lead. The four white lines melted into shapeless masses. They rocked and reeled like sinking vessels. In a vain, last effort to lead them on, their officers faced death and found it. All three brigadiers and two of the colonels went down. Louis-Joseph de Montcalm was the only one of four French generals still on horseback and he was wounded while trying to keep the Languedoc men in action. Suddenly, on the right, the La Sarre and Languedoc battalions turned and ran. A moment more, and Bearn and Guyenne, in the centre, had followed them. The wounded Louis-Joseph de Montcalm rode alone among the mad rush of panic-stricken fugitives. But over towards the St Lawrence cliffs he saw the blue line of the Royal Roussillon still fighting desperately against the overlapping redcoats. He galloped up to them. But, even as he arrived, the whole mass swayed, turned, and broke in wild confusion. Only three officers remained. Half the battalion was killed or wounded. Nothing could stay its flight. On the top of the crest of ground, where he had formed his line of attack only a few minutes before, Louis-Joseph de Montcalm was trying to rally some men to keep back the pursuing British when he was hit again, and this time he received a mortal wound. He reeled in the saddle, and would have fallen had not two faithful grenadiers sprung to his side and held him up. His splendid black charger seemed to know what was the matter with his master, and walked on gently at a foots pace down the Grande Allee and into Quebec by the St Louis Gate. Pursuers and pursued were now racing for the valley of the St Charles, and Quebec itself was, for the moment, safe. Never was there a greater rout than on the Plains of Abraham at ten o'clock that morning. The French and Canadians ran for the bridge of boats, their only safety. But they came very close to being cut off both in front and rear. Marquis de Vaudreuil had poked his nose out of one of the gates of Quebec when the flight began. He then galloped down to the bridge, telling the Canadians on the Cote dAbraham, which was the road from the Plains to the St Charles, to make a stand there. Having got safely over the bridge himself, he was actually having it cut adrift, when some officers rushed up and stopped this crowning act of shame. This saved the fugitives in front of the broken army. Meanwhile the flying troops were being saved in the rear by the Canadians at the Cote dAbraham under a French officer called Jean-Daniel Dumas. These Canadians had not done much in the battle, for various reasons one was that the fighting was in the open, a mode of warfare in which they had not been trained the British, moreover, used bayonets, of which the Canadians themselves had none. But in the bush along the crest of the cliffs overlooking the valley they fought splendidly. After holding back the pursuit for twenty minutes, and losing a quarter of their numbers, they gave way. Then a few of them made a second stand at a mill and bakery in the valley itself, and were killed or wounded to a man. Louis-Joseph de Montcalm heard the outburst of firing at the Cote dAbraham. But he knew that all was over now, that Canada was lost, and with it all he had fought for so nobly, so wisely, and so well. As he rode through St Louis Gate, with the two grenadiers holding him up in his saddle, a terrified woman shrieked out Oh look at the marquis, hes killed, hes killed It is nothing at all, my kind friend, answered Louis-Joseph de Montcalm, trying to sit up straight, you must not be so much alarmed Five minutes later the doctor told him he had only a few hours to live. So much the better, he replied I shall not see the surrender of Quebec. And then, his public duty over, he sent a message to each member of his family at Candiac, including poor Mirete, for not a word had come from France since the British fleet had sealed up the St Lawrence, and he did not yet know which of his daughters had died. Having remembered his family he gave the rest of his thoughts to his God and to that other world he was so soon to enter. All night long his lips were seen to move in prayer. And, just as the dreary dawn was breaking he breathed his last. War is the grave of the Louis-Joseph de Montcalm's.